The purpose of this study was to evaluate the dosimetric effect of the leaf width of a multileaf collimator (MLC) in intensity-modulated radiotherapy (IMRT) delivery techniques for small- and large-volume targets. We retrospectively selected previously treated 5 intracranial and 5 head-neck patients for this study to represent small- (range, 18.37-72.75 cc; mean, 42.99 cc) and large-volume (range, 312.31-472.84 cc; mean, 361.14 cc) targets. A 6-MV photon beam data was configured for Brianlab m3 (3 mm), Varian Millennium 120 (5 mm) and Millennium 80 (10 mm) MLCs in the Eclipse treatment-planning system. Sliding window and step-shoot IMRT plans were generated for intracranial patients using all the above-mentioned MLCs; but due to the field size limitation of Brainlab MLC, we used only 5-mm and 10-mm MLCs in the head-and-neck patients. Target conformity, dose to the critical organs and dose to normal tissues were recorded and evaluated. Although the 3-mm MLC resulted in better target conformity (mean difference of 7.7% over 5-mm MLC and 12.7% over 10-mm MLC) over other MLCs for small-volume targets, it increased the total monitor units of the plans. No appreciable differences in terms of target conformity,organ at risk and normal-tissue sparing were observed between the 5-mm and 10-mm MLCs for large-volume targets. The effect of MLC leaf width was not quantifiably different in sliding window and step and shoot techniques. In addition, we observed that there was no additional benefit to the sliding-window (SW) technique when compared to the step-shoot (SS) technique as a result of reduction of MLC leaf width. The development of inverse planning systems and methods for delivering nonuniform radiation intensities have ushered in the era of intensity-modulated radiation therapy (IMRT), representing the state of the art in the treatment of many cancers. IMRT is one of the conformal radiotherapy techniques, which modulates the beam to create a conformal dose distribution around the target while minimizing dose to the surrounding normal tissues and enables tumor dose escalation. There are two ways of modulating the beam intensity in traditional IMRT - sliding-window (SW) / dynamic IMRT (continuous beam modulation) and step-shoot (SS) / multiple static segment (sequential exposure of sub-beams or segments) IMRT  . Multileaf collimator (MLC) is an important tool for beam modulation in IMRT delivery, which is available with different leaf widths. Since its introduction, the MLC leaf width has been reduced (e.g., from 10 mm to 2.5 mm) with the expectation to yield improvement in target conformity and normal-tissue sparing. The geometric changes in the MLC imply dosimetric considerations in IMRT, because the fluence map corresponding to a modulated field depends on how the leaves can shape the area of interest while protecting the normal tissue as well. Abundant literatures are available on the dosimetric effect of the leaf width of MLC in IMRT on different sites. ,,,,,,, These literatures reveal that significant improvement in plan quality was observed by using narrower leaves. These studies are limited to a particular IMRT delivery technique (either in SW or SS delivery). As the two IMRT techniques are different by their nature of delivery, the effect of MLC leaf width may also differ. There is no head-to-head comparison of the effect of MLC leaf width between SW and SS IMRT techniques. In this study, we attempted to evaluate the difference in dosimetric impact of MLC leaf width between SW and SS IMRT techniques in small- and large-volume targets. A 6-MV photon beam data was configured in the Eclipse treatment planning system (Varian Medical Systems, Palo Alto, CA) with Brianlab m3 (3 mm), Varian Millennium 120 (5 mm) and Millennium 80 (10 mm) MLCs. The physical characteristics of these MLCs are tabulated in [Table 1]. The smallest leaf width (3 mm) used in this study is Brianlab m3 MLC (Brianlab AG, Munich, Germany). The medium (5 mm) and the widest (10 mm) leaf width MLCs used were Millennium 120 and Millennium 80 (Varian Medical Systems, Palo Alto, CA), respectively. To study only the dosimetric effect of leaf width, we intentionally used the same MLC dosimetric parameters (average leaf transmission, 2%; and static leaf gap, 2 mm) for all the configured MLC models. We retrospectively selected 5 previously treated intracranial (Pituitary Adenoma) patients to replicate the small-volume (SV) targets with the mean target volume of 43 cc (range, 18.37-72.75 cc). The T1-weighted magnetic resonance images (2 mm slice thickness) were fused with contrast-enhanced radiotherapy planning CT images (2 mm slice thickness) to aid the delineation of the gross tumor volume (GTV). A symmetric margin of 5 mm was given to GTV to generate planning target volume (PTV). The prescription dose was 45 Gy in 25 fractions. We retrospectively selected 5 previously treated head-neck (stage T1T2, N0) patients for this study to replicate large-volume (LV) targets. GTV, Clinical Target Volume CTV and PTV were delineated in the contrast-enhanced CT images (3 mm slice thickness). All patients were planned for simultaneous integrated boost (SIB) utilizing a single plan to irradiate gross and microscopic disease at different dose-per-fraction values. The high-risk PTV (HR PTV) included the gross disease, and the low-risk PTV (LR PTV) was defined as the uninvolved adjacent lymph nodes at risk. , The mean target volume (both HR + LR PTV) was 362 cc (range, 298-443 cc). The prescription dose was 70 Gy in 35 fractions for HR PTV and 56 Gy in 35 fractions for LR PTV. Both the parotid glands and spinal cord were considered as critical organs. The Eclipse treatment planning system, version 8.1 (Varian Medical Systems, Palo Alto, CA), was used in this study. Each of the SV group patients was planned for IMRT using all the three configured MLCs. To ensure fair comparison, all plans of a particular patient were optimized individually with the same dose constraint parameters. As the prescription dose of SV target is below the tolerance dose of the i.e. the optic chiasm, and the location of the organis within the PTV, no OAR was considered during optimization. The dose volume optimizer (DVO) inverse planning algorithm (Ver. 8.1) was used to obtain the optimal fluence. The optimal fluences were converted into actual fluences by leaf motion calculator (LMC) for both SW and SS delivery techniques. The beamlet size used by the treatment planning system is not user configurable (i.e., beamlet width in the direction of leaf motion is fixed at 2.5 mm, and perpendicular to the direction of leaf motion is the MLC leaf width). The number of intensity modulation levels in SS technique specifies the resolution of converting an idealized intensity-modulated fluence distribution into a deliverable fluence map. Higher the number of modulation levels, greater is the number of monitor units and segments required for delivery. It is recommended to have 10 or more intensity levels to produce dose distributions comparable with those in the SW technique. So all plans of SS technique were generated with 15 levels of intensity modulation. Parameters such as the number of beams, gantry angles and field sizes were kept constant for a particular case. The dose calculation was performed using pencil beam convolution algorithm (Ver. 8.1) for a grid size of 2.5 mm with modified Batho's heterogeneity correction. In LV cases, due to the field size limitation (maximum, 10 × 10 cm 2 ) of 3-mm MLCs, only 5-mm and 10-mm MLCs could be used to generate SW and SS IMRT plans. The parotid glands and spinal cord were considered as OARs in the optimization process. All plans were normalized at the target mean dose. All plans were accepted with the criterion that at least 95% isodose envelope should encompass the entire PTV without any hot spot above 107%. The parotid glands were constrained to receive a mean dose of < 26Gy; whereas for spinal cord, the maximum dose was restricted to below 45 Gy. The 95% dose volume, 50% dose volume, target volume, parotid glands mean dose, spinal cord maximum dose, and total monitor units were recorded for evaluation. The plan quality was evaluated in terms of target conformity, OAR and normal-tissue sparing. The following indices were used. Conformity Index (CI) , was used to assess the target coverage. The 95% isodose volume was taken as reference isodose volume. The CI value is 1 for an ideal plan. In case of LV group patients, the CI was calculated separately for HR PTV and LR PTV. The normal-tissue dose irradiation by different MLCs was evaluated by using the Normal-Tissue Dose Factor (NTDF). 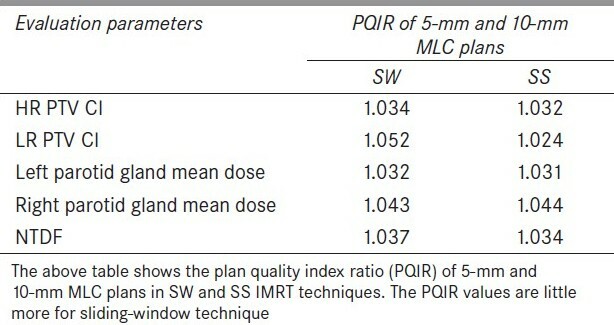 PQIR CI 3 mm / 5 mm = CI of 3-mm plan / CI of 5-mm plan. PQIR NTDF 3 mm / 5 mm = NTDF of 3-mm plan / NTDF of 5-mm plan. 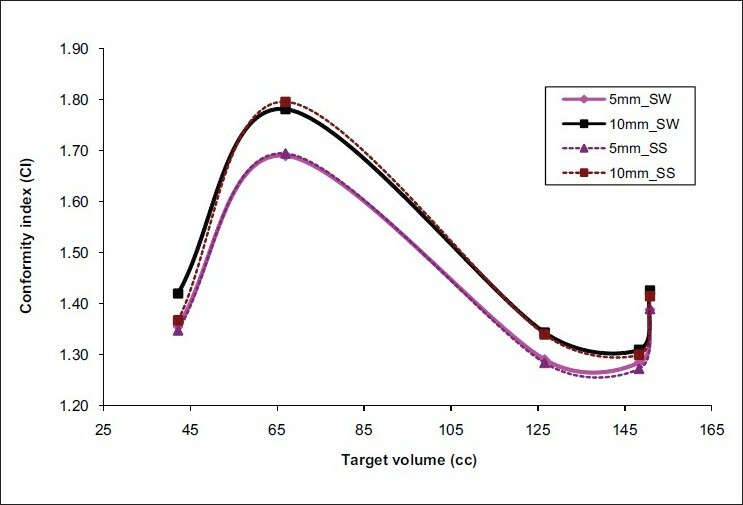 The 3-mm MLC plans resulted in better target conformity and normal-tissue sparing when compared to 5-mm and 10-mm MLC plans in both the IMRT techniques. The average conformity index (mean ± SD) of 3-mm, 5-mm and 10-mm MLCs was 1.39 ± 0.08, 1.50 ± 0.08, and 1.57 ± 0.07 for SW IMRT; and 1.38 ± 0.08, 1.49 ±0.07, and 1.54 ± 0.05 for SS IMRT; respectively. 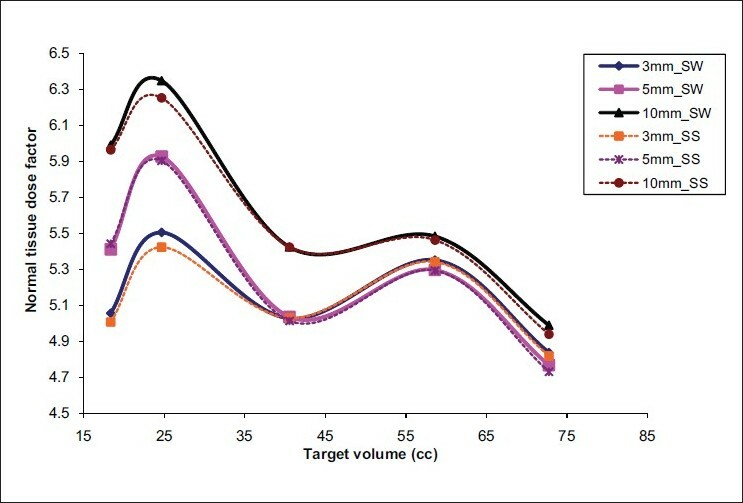 The conformity index was superior for smaller leaf widths; but as the volume of the target increased, the difference in conformity indices of the MLCs decreased [Figure 1]. There was no appreciable difference between 3-mm and 5-mm leafs in terms of NTDF; but 10-mm leaf was found to irradiate a little more of normal tissue [Figure 2]. The 'mean ± SD' value of NTDF for 3-mm, 5-mm and 10-mm MLCs was 5.19 ± 0.281, 5.29 ± 0.44, and 5.65 ± 0.53 for SW IMRT; and 5.16 ± 0.30, 5.28 ± 0.44, and 5.61 ± 0.51 for SS IMRT; respectively. 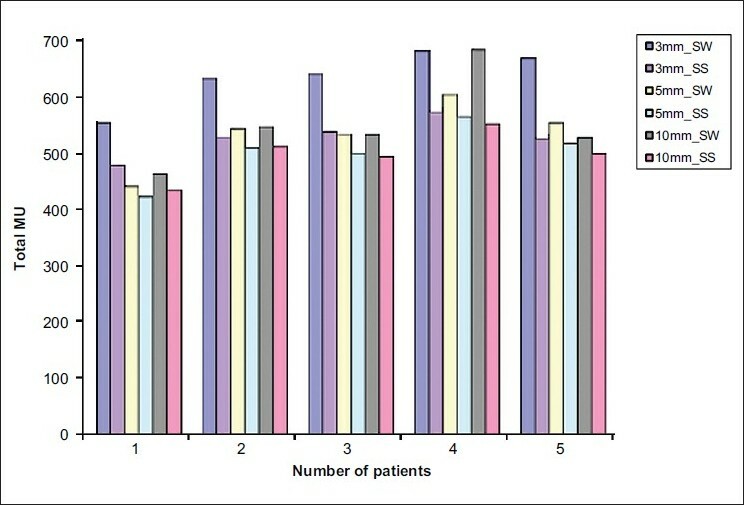 The 3-mm IMRT plans always required increased total number of monitor units (MUs) compared to other MLCs [Figure 3]. When comparing the SW and SS techniques, the 95% and 50% volumes were always less for SS technique. Consequently, the CI and NTDF values of SS technique were slightly better than those of SW technique. The PQIR values for various MLCs were calculated to compare the leaf width effects in SW and SS techniques [Table 2]. Overall, though the PQIR values were about the same in both the IMRT techniques, the magnitude of PQIR was slightly more in SW technique. The conformity index (mean ± SD) of 5-mm and 10-mm MLCs for HR PTV was 1.40 ± 0.17 and 1.45 ± 0.19 for SW IMRT; and 1.40 ± 0.17 and 1.44 ± 0.20 for SS IMRT; respectively. Similarly, for LR PTV, the value of CI of 5-mm and 10-mm MLCs was 1.64 ± 0.39 and 1.72 ± 0.41 for SW IMRT; and 1.67 ± 0.46 and 1.70 ± 0.44 for SS IMRT; respectively. These results revealed that the values of CI of 5-mm and 10-mm MLCs were not substantially different for large-volume targets. Both the MLCs were able to provide the mean dose of parotid glands below 26 Gy. The average right parotid gland mean dose for 5-mm and 10-mm MLCs was 24.32 ± 2.30 Gy and 25.37 ± 2.42 Gy for SW IMRT; and 23.87 ± 2.05 Gy and 24.95 ± 2.08 Gy for SS IMRT; respectively. Whereas the average left parotid gland mean dose for 5-mm and 10-mm MLCs was 22.33 ± 1.90 Gy and 23.05 ± 2.10 Gy for SW IMRT; and 22.03 ± 1.71 Gy and 22.76 ± 1.85 Gy for SS IMRT; respectively. Our results demonstrated that the dose to parotid glands and that to spinal cord were not quantifiably different. The NTDF values and total MUs were almost the same for both the MLCs. Like SV targets, the 95% and 50% volumes were always less in SS technique for LV group patients; correspondingly the CI and NTDF values in SS technique were slightly better than those in SW technique. The PQIR values for 5-mm and 1-mm MLCs were calculated for the two IMRT techniques [Table 3]. 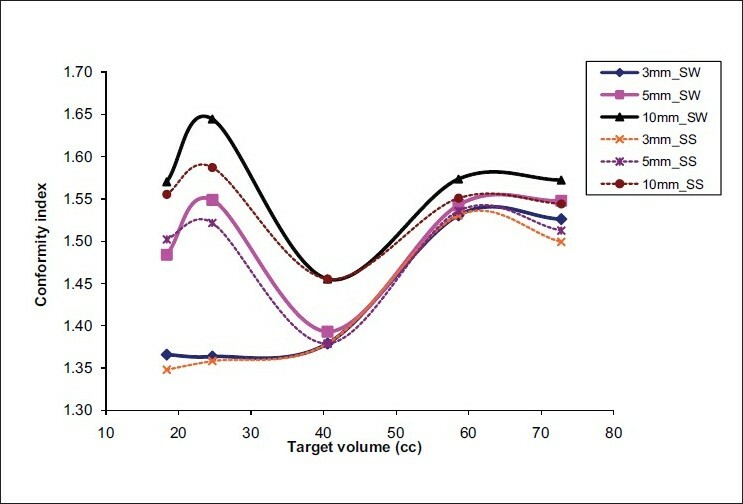 The 5-mm and 10-mm MLCs had almost similar results with regard to target conformity [Figure 4], OAR and normal-tissue sparing in both the IMRT techniques. The 3-mm MLC could produce better target conformity (average difference of 7.7% over 5mm and 12.7% over 10mm MLC) and normal-tissue sparing in SV targets, and this advantage diminished as the target volume increased [Figure 1]. However, this relation may not be true for targets with irregular shapes and needs a separate study. The 3-mm IMRT plans always required increased total number of monitor units [Figure 3]. As the beamlet size of optimizer is determined by the MLC width (perpendicular to the leaf motion direction), plans with smaller leaf widths have more number of beamlets. This leads to increment of total number of MUs in MLC plans with smaller leaf widths. Further, the lower leaf speed (maximum, 1.5 cm/s) of the 3-mm MLC was also a rationale for rise in total number of MUs, especially in SW delivery. In case of LV targets, the quality indices of 5-mm and 10-mm plans did not differ much, and they did not show any noticeable relation with target volumes. As the SW and SS IMRT delivery techniques are different by their nature, one may intuitively think that the leaf width effect may also vary. Therefore, we compared the leaf width effect between SW and SS IMRT techniques as well. We calculated the ratio of plan indices between the MLC plans for comparison. We found that the effect of MLC leaf width was not demonstrably different between the two techniques and there was no additional benefit to the SW technique when compared to the SS technique as a result of reduction of MLC leaf width. However, the accuracy of the results presented here may vary with parameters such as optimization algorithms, shape of the target (irregularity) and location of the OAR. The SS delivery technique will be more close to optimal fluence with increased intensity levels. Hence the intensity level of the SS technique may also modify the results. Dosimetric effects of MLC leaf width were studied for small- and large-volume targets in SW and SS IMRT techniques. The 3-mm MLC has the best conformity among all the MLCs in case of small-volume targets, but it increases the total number of MUs. The 5-mm and 10-mm MLCs resulted in similar plan-quality indices in case of large-volume targets. When comparing SS and SW techniques, the effect of the MLC leaf width is nearly the same in both the techniques. This work is done under the project "Setting up of a linear accelerator for three-dimensional and intensity modulated radiotherapy" sponsored by the Department of Science and Technology (DST), Government of India. 1. Blanco AI, Chao KS. Intensity-Modulated Radiation Therapy and Protection of Normal Tissue Function in Head and Neck Cancer.in Principles and Practice of Radiation Oncology: Updates. Vol. 3. New York: Lippincott Williams and Wilkins Healthcare; 2002. 2. Williams PC. Review article IMRT: Delivery techniques and quality assurance. Br J Radiol 2003;76:766-76. 3. Leal A, Sánchez-Doblado F, Arráns R, Capote R, Lagares JI, Pavón EC, et al. MLC leaf width impact on the clinical dose distribution: A monte carlo approach. Int J Radiat Oncol Biol Phys 2004;59:1548-59. 4. Fiveash JB, Murshed H, Duan J, Hyatt M, Caranto J, Bonner JA, et al. Effect of multileaf collimator leaf width on physical dose distributions in the treatment of CNS and head and neck neoplasms with intensity modulated radiation therapy. Med Phys 2002;29:1116-9. 5. Bortfeld T, Oelfke U, Nill S. What is the optimum leaf width of a multileaf collimator?. Med Phys 2000;27:2494-501. 6. Burmeister J, McDermott PN, Bossenberger T, Ben-Josef E, Levin K, Forman JD. Forman.Effect of MLC leaf width on the planning and delivery of SMLC IMRT using the CORVUS inverse treatment planning system. Med Phys 2004;31:3187-93. 7. Jin JY, Yin FF, Ryu S, Ajlouni M, Kim JH. Dosimetric study using different leaf-width MLCs for treatment planning of sliding window conformal arcs and intensity-modulated radiosurgery. Med Phys 2005;32:405-11. 8. Wu Q, Mohan R, Stein J, Wang X, Yang J. The impact of leaf width of MLC on intensity-modulated 3DCRT of prostate. Med Phys 1996;23:1170. 9. Nill S, Tücking T, Münter MW, Oelfke U. Intensity modulated radiation therapy with multileaf collimators of different leaf widths: A comparison of achievable dose distributions. Radiother Oncol 2005;75:106-11. 10. Zhu XR, Prado K, Liu HH, Guerrero TM, Jeter M, Liao Z, et al.Intensity-modulated radiation therapy for mesothelioma: Impact of multileaf collimator leaf width and pencil beam size on planning quality and delivery efficiency. Int J Radiat Oncol Biol Phys 2005;62:1525-34. 11. Wu Q, Manning M, Schmidt-Ullrich R, Mohan R. The potential for sparing of parotids and escalation of biologically effective dose with intensity-modulated radiation treatments of head and neck cancers: A treatment design study. Int J Radiat Oncol Biol Phys 2000;46:195-205. 12. J.M. Sheldon, K.M. Forster, L.B. Harrison, R.R. Woode, H.J. Lee, C.M. Burman, C.S. Chui, et al. Dose escalation for maxillary sinus cancer using intensity modulated radiation therapy (IMRT). Int J Radiat Oncol Biol Phys 1997; Vol. 39, Issue 2, Supplement 1, Page 237. 13. Zhu XR, Schultz CJ, Gillin MT. Planning quality and delivery efficiency of sMLC delivered IMRT treatment of oropharyngeal cancers evaluated by RTOG H-0022 dosimetric criteria. J App Clin Med Phys 2004;5:80-95. 14. Paddick I. A simple scoring ratio to index the conformity of radiosurgical treatment plans. J Neurosurg 2000;93:219-22. 15. Shaw E, Scott C, Souhami L, Dinapoli R, Kline R, Loeffler J, et al. Single dose radiosurgical treatment of recurrent previously irradiated primary brain tumors and brain metastases: Finalreport of RTOG protocol 90-05. Int J Radiat Oncol Biol Phys2000;47:291-8. 16. Jothybasu KS, Bahl A, Subramani V, Rath GK, Sharma DN, Julka PK. Static versus dynamic intensity modulated radiotherapy: Profile of integral dose in carcinoma of the nasopharynx. J Med Phys 2009;34:66-72. 17. Nicolini G, Fogliata A, Cozzi L. IMRT with the sliding window: Comparison of the static and dynamic methods. Dosimetric and spectral analysis. Radiother Oncol 2005;75:112-9.